We know that everything can change in a second. We’re here for all the moments afterwards. At Essex & Herts Air Ambulance we understand that sudden injuries and illnesses effect all involved. Whether a patient, family member or friend, you may have questions, concerns or need extra help. 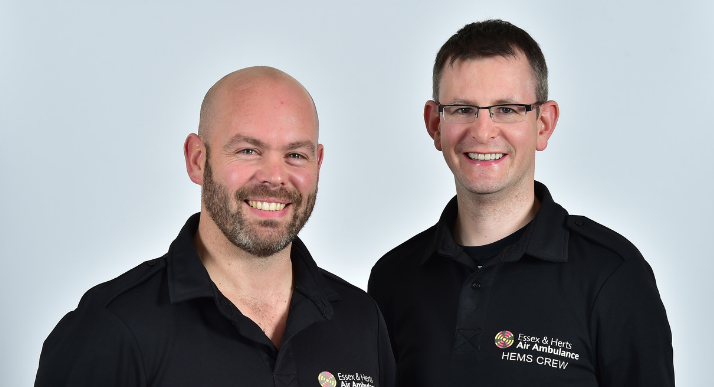 Our Patient Liaison Managers Adam Carr and Tony Stone will work quickly and sensitively to provide the care you need. Experiencing sudden injuries and illnesses can be distressing. For this reason, it’s very common to suffer from memory blanks between the incident occurring and being in hospital. We can fill in the gaps and help complete the bigger picture for you. Do you have any questions about the care provided by our Air Crew? There might be a procedure you would like to know more about, you might want to know why we went to a certain hospital, or there might be other queries about our service. We’re keen to answer any questions you have. We want to do the best job we can, so we appreciate any feedback you have, whether it’s good or constructive. Your comments will be used to improve our service so we can continue to help patients and their loved ones across Essex, Hertfordshire and the surrounding areas. At this stage it might not be our help you need the most. We understand that finding the on-going support for you can be challenging. Our close links with local injury and illness-specific support organisations means we can point you in the right direction during these difficult times. The Brain & Spine Foundation is the only UK-wide charity providing expert information, support and education across the full range of neurological problems. Their free Helpline, staffed by Neuroscience Nurses, along with accredited and downloadable booklets and fact sheets, allows them to provide much-needed quality information and support to those affected. The Road Victims Trust provides free, confidential, emotional and practical support to those affected by fatal road collisions across Bedfordshire, Cambridgeshire and Hertfordshire. Changing Faces supports people who have any condition or injury that affects their appearance. They also offer skin camouflage services in England and Scotland. Skin camouflage uses specialist products to temporarily cover, or reduce the visibility of scars and skin conditions. The LA supports amputees, pre and post-amputation, to navigate the associated complexities with advice, information and signposting to empower individuals and their families to optimise their recovery and rehabilitation. Sudden Cardiac Arrest UK was started as a Facebook group in May 2015 by an SCA survivor after a meet-up of survivors and family members coming to terms with their recovery. The group is friendly, non-judgemental, empathic and aims to help its members in their recovery by providing answers to any questions they may have. As well as the online support group there have been a number of group meet ups and activities. Meeting others who “get it” can be a real help on the path to recovery. If you have been dissatisfied in any way, please let us know. One of our Managers will be in touch with you as soon as possible to discuss further. The Care Quality Commission (CQC) is the independent regulator of health and social care in England. 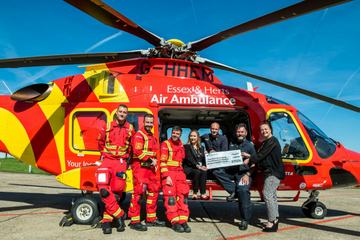 They aim to make sure health and social care services (such as Essex & Herts Air Ambulance) provide people with safe, effective, compassionate, high-quality care and they encourage care services to improve. More information can be found at www.cqc.org.uk. Would you like to Thank the Crew through our website?